Standard spring typeholders are supplied in 3 sizes 2, 3 and 4 inch and will accept type from 8pt to 36pt. They are cast from gun metal and machined square inside. The steel backplate is bevelled to a fine edge to aid sighting. 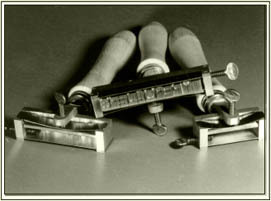 Super rapid typeholders are self centring and accept type from 10pt to 36pt in 4 inch length only. 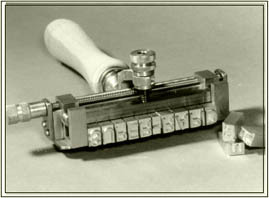 The two jaws are centred when the right hand screw is turned to make side spacing unnecessary. A solid brass ring used to rest decorative wheels and fillets on the finishing stove, enabling a more even heat distribution.